Patina Initial Necklace Only $4.95! You are here: Home / Great Deals / Patina Initial Necklace Only $4.95! 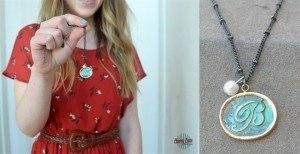 Check out this fun and cute necklace that is perfect to give as a gift for Mother’s Day or Teacher’s Appreciation at the end of the school year! Patina Initial Necklace Only $4.95! So cute and unique and sure to make someone on your gift list happy! Grab this and other great trendy fashion deals every day at Jane!